Today I bring you through the design process of a vaccum adapter for the HF500 spindle from my Stepcraft CNC router. I have shared the files at Thingiverse for those who want to 3dprint it or modify it. 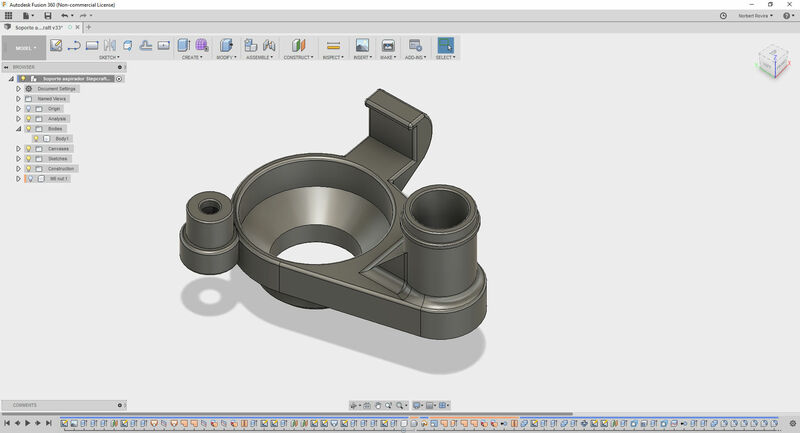 Everything done with the trendy CAD tool: Fusion360. I frequently work with a CNC router from Stepcraft, built as a kit more or less a year ago. It has an add-on to connect a vacuum cleaner directly under the spindle and around the mill, so you can reduce the amount of dust small pieces fo wood floating around. But short after I started using it I found a problem. At Artecitos I cut a lot of MDF and since it’s pressed fiber it makes a lot of dust that tends to stick everywhere, so the original adapter got clogged quickly. But it’s not practical at all. You cannot leave a CNC router working alone, this is clear, but it would be enough to stay around with attention. So I started hands on to design with Fusion 360. Since I wanted to reuse the rest of parts I used my digital caliper to measure anything that came to my mind. From there I went to Fusion360, to create a sketch and have this first plane drawn in 2D. You can import pictures as canvas and I used that with this picture from above. Works better the higher you are because the camera lens deforms the perspective. You can see it a bit in this one, but I used it mainly as a guide to know where the big parts were located. For the rest I had my measures. Form there it’s just a question of making extrusions and some more complex operations until you get the shape you want. It’s very difficult to make something perfect at the first try, you usually have to make iterations, and in my case I made several. You can see here the six prints I tested with the original part. first test to verify measures for the main holes are correct. almost final model, without magnets. The lateral clamp breaks and I need to reinforce it. The internal tubing is still not wide. design with holes to insert magnets. I thought I could warm the magnets with a soldering iron and push them down to their place but it was to much distance to travel and I made a mess. four magnets inserted (pause the print, insert the magnets and resume printing on top), lateral clamp thickened but still breaks. five magnets inserted, internal cavity improved, clamp reinforced and everything well adjusted. But the magnets do not hold with enough strength the curtain (don’t know in English…) so I can use it reliably. the one mounted: 8 magnets inserted, reinforced clamp is nearer but still leaving some space to mount it easily. This is how the final design looks like. Since I know other people found the same issue, I shared it in Thingiverse. PS: you may be interested in this, only for Spain. At Artecitos Instagram we are making a draw with a price of earrings or keychain, up to the winner. Check the draw terms in the post. Everything is cut with tho machine!